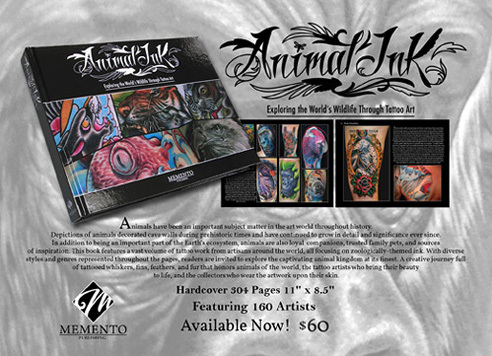 I'm very excited to announce that Animal Ink: Exploring the World's Wildlife Through Tattoo Art is now Available! This high-quality 11" x 8.5" hardcover book is brought to you by Memento Publishing and features the work of an all-star list of Tattoo Artists. Animal Ink: Exploring the World's Wildlife Through Tattoo Art, is a feast for the eyes and is brimming with inspiration. Featuring 304 full-color pages, this artistic beauty not only contains tattoo work from 160 talented tattoo artists, but in addition, includes 62 stories about specific animal tattoos with details, meanings, and inspiration from the collectors who wear the ink and the artists who inked them. Animal designs have appeared throughout history in all facets of the art world, so it's no surprise that utilizing animals' beauty, strength, and grace has been a large focus within the genre of tattoo art. For those seeking animal tattoos, there is an endless array of styles, creativity, and artists to choose from and Animal Ink encompasses and celebrates these many different displays within its pages by featuring over 1,500 tattoos from creatures of the wild kingdom. Click here to order your copy today!